People value Thanksgiving as a time of family. Frequently, one family home is not big enough to host the entire family. For those who want a bit of a getaway for Thanksgiving, look no further than Cabin Creekwood, the premier Sherando Lake cabins rentals. Cabin Creekwood is the perfect option for a family Thanksgiving trip. Sherando Lake is located one mile from our cabins. The lake is great for a family trip hiking or biking the trails or just admiring the view. The fall colors are blossoming right now, you won’t want to miss it! The highlight of Thanksgiving is always the feast. For you and your family, Cabin Creekwood is a great option to get the family together and cook a delectable dinner. We have several three bedroom cabins with full size kitchens. If you’re a larger family, rent several of our beautiful cabins and join together in the middle. Our cabins offer all the amenities you need to create the traditional spread and family feel for a Thanksgiving meal to remember. If your family isn’t the cooking type, don’t worry! 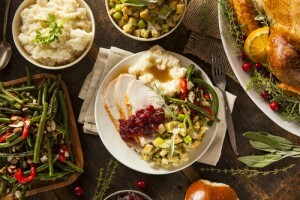 There are several places in and around Staunton, Virginia to enjoy a fantastic Thanksgiving dinner. In beautiful downtown Staunton, just a short 30 minute drive from Cabin Creekwood, there is the Stonewall Jackson Hotel and Conference Center which will serve a Thanksgiving buffet. Also on Thanksgiving Day, Rowe’s Restaurant on Rowe Road will be serving a classic spread for your enjoyment. Fifteen minutes west of Staunton is the Buckhorn Inn, also known for their amazing Thanksgiving buffet. Those are just a few of our recommendations, however, there are many more restaurants in the area that are sure to fit your needs. For a memorable family Thanksgiving, don’t forget the best Sherando Lake Cabins, Cabin Creekwood in Lyndhurst, Virginia.